Flow is an intuitive After Effects tool to control the speed and influence of keyframes within After Effects. It’s a fresh new approach to creating animation with a focus on the style and timing by allowing you to quickly set the easing values for multiple keyframes. There are plenty of tools that allow you to manually enter values to control the influence of selected keyframes, but the appeal here is the ease of use and flexibility of Flow to allow you to control both the speed and influence in a really intuitive way. Once installed, it appears as a nicely designed panel which comes with a small library of presets which you can build on, saving your favourites and then sharing these with other animators. This helps to create a streamlined approach to collaborative projects as you can use a set of presets that fit each animation and share these within a team, maintaining a similar look across a range of videos. Flow can also read in bezier values from selected keyframes to save as new presets or to simply copy and apply to others keyframes. 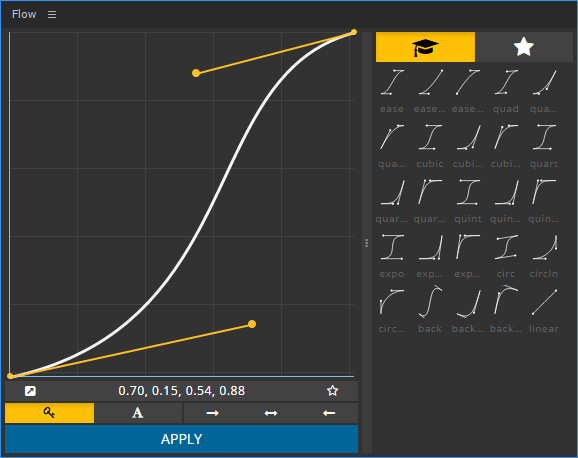 It’s a great tool, devised by Zack Lovatt and renderTom, to help new users get started in animation – the graph editor can be daunting and this goes some way to bridge the gap in understanding what easing can do. FX Console is a new workflow plug-in from Video Copilot that allows for quick access to favourite presets and effects from a single shortcut key. Initially, it looks similar to an alternative called Quick Menu but FX Console also allows for certain effects to be ‘blacklisted’ so that they no longer show up in the list, as well as allowing you to assign alternate names to find effects that are often misspelt or forgotten. For example, a common effect we use is Motion Tile but often the name isn’t obvious for what it’s used for. Therefore an alternative term such as ‘edge repeat’ or ‘mirror edges’ can be assigned to make sure it appears in search results. FX Console also allows you to assign your favourite effects to a speed dial panel below the search box, helping to speed up a general workflow even further. The plug-in also allows you to take snapshots of the active viewport, similar to the default Snapshot Tool, but allows multiple snapshots to be compared in a gallery as well as allowing snapshots to be saved to send on to clients. It’s a great plug-in that helps to build on the effectiveness of the default Effects & Presets window with extra features added to boost what it can be used for. Joysticks ‘n Sliders is an After Effects tool that we’ve recently adopted to provide more flexibility for rigging and animating characters. It’s a tool that takes a new look at the rigging process, allowing animators to smoothly transition between different character poses with a simple joystick controller. Simply create 5 key poses, link the layers to the joystick and animate away. The joystick interpolates smoothly between the poses based on the joystick’s direction and helps to dramatically simplify character animation. It’s great for facial animation too. You can easily switch to different artwork depending on which way your character is facing, as used in the Trump Facts animations by the supremely talented Cub Studio. The sliders element of the tool works in a similar way but links directly to a set of attributes, allowing you to control multiple values with a single HUD controller. It provides a quick way to change values, affecting several layers at once.